While kitchens and bathrooms are the most popular home renovation projects, the laundry room is beginning to become a sought after renovation area. Long gone are the days of having the laundry room hidden from the rest of the home. Nowadays, laundry rooms are now integrated into home design, instead of being thrown into the floor plan as an afterthought. Over the years, laundry rooms have gone through several transitions. First, they moved out of the basement and onto the main floor. Still, they were often neglected and placed in the mud room or garage. More recently, they have been making a move to the second floor, or close to the bedrooms. Oftentimes, laundry rooms will be located nearest the master bedroom, or even part of the master closet. The biggest advantage in having the laundry room near the bedrooms, or as part of the closet, is because it is near where most of the dirty clothes, sheets, blankets, and other items are generated. 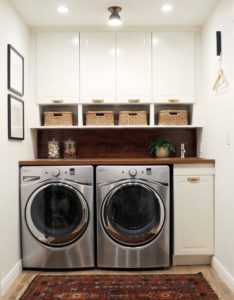 While laundry rooms were once an afterthought in design, many homeowners are striving to make the laundry room (and process) more enjoyable. This is often accomplished by making the laundry room more stylish and functional, and with better storage. 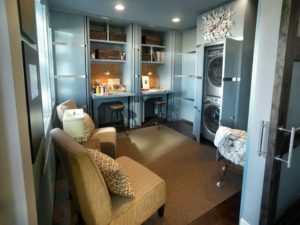 Surprisingly, laundry rooms can be turned into the perfect multi-purpose room for anything from crafts, to an office space. Having a laundry room serve as a multi-purpose room is the perfect way to add a little bit of extra space that your family needs. 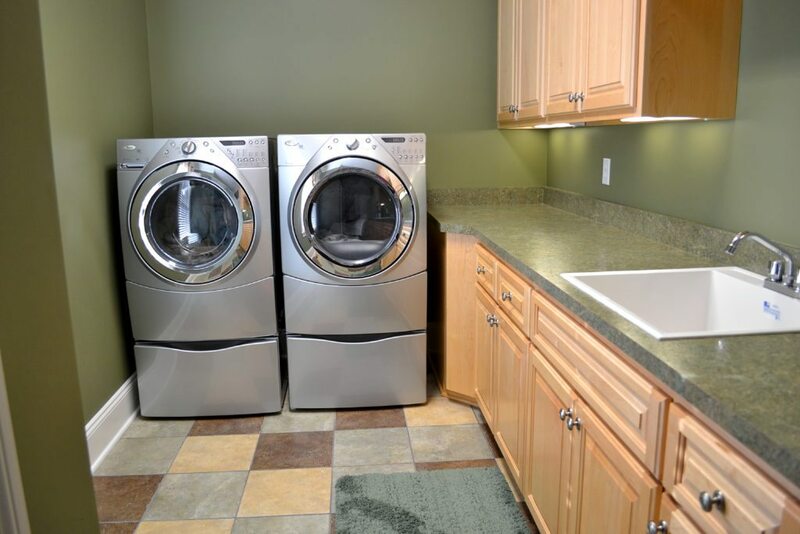 Some homeowners might have their laundry room located right off of the kitchen area. The laundry room can then serve as a place to store overflow pantry items, or even a a wine fridge. When designing a laundry room, it is important to create a functional design by placing certain elements near or adjacent each other. These items include the appliances, supplies, hamper, and work surface. Appliances. Having the washer and dryer placed side by side makes it easier to transfer wet clothes without creating a mess. Supplies. Having the laundry detergent and fabric softener in an easy to reach place will make the process that much more enjoyable. We recommend storing detergents, stain removers, and any other related items in a bin or basket, or on an easy to reach shelf. Hamper. A great to maximize the efficiency of the laundry area is to add in a place for the laundry hamper. This can include a pull out cabinet solution, large shelves, or an open niche. Work Surface. Having a counter or table top space is perfect for sorting, spot treating, or making any repairs to your garments. Some other things to include in the laundry room can include drying racks, an ironing board, and a steamer. Choosing finishes and materials for the laundry room can be tricky. Since laundry rooms experience frequent spills and sprays, it is best to choose materials that are durable versus materials that are ultra luxurious. Some great options for floors are low cost linoleum, cork, or vinyl. Having wood floors in the laundry room may not be the best choice due to the likelihood of moisture in the room. As far as countertops go, it is important to choose something that is low maintenance. While natural stones, such as marble, are beautiful and timeless, they are porous and prone to stains. For a laundry room, it is best to stick with laminate or an engineered stone, such a quartz. Overall, renovating your laundry room will add value to your home in more ways than one. If you are interested in a home renovation project, please call Balducci Additions and Remodeling for a free estimate!